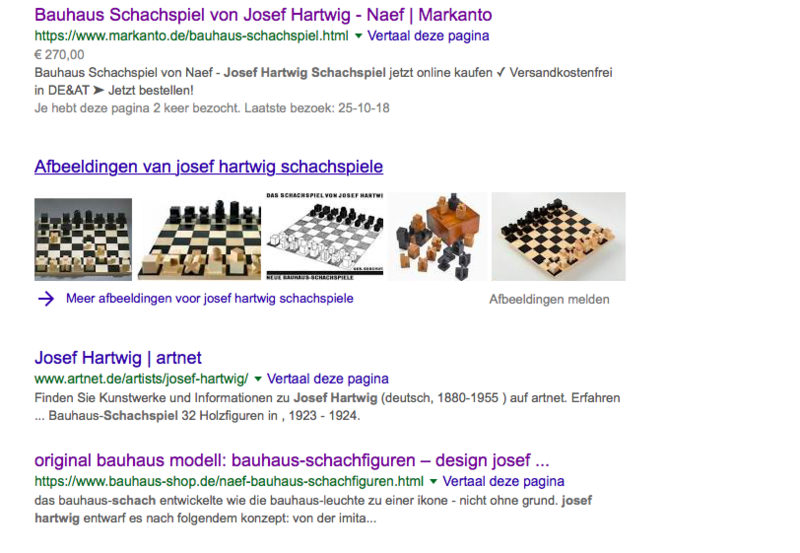 Although I never have played chest I was quite intrested in this chess set from Josef Harwig. When I was searching for the information I immediatly would think of how much info I could get out of this webpage or this book? It became kind of this game the books with a lot of information about the chess set became the kings or the queens of the game the other ones the pawns, the castles, the knights or the bishops. It’s like a chess game you have the book information vs the information you can find on the internet, like white versus black. The books are the white game members. You can find a lot of books about Bauhaus. Only in the Stedelijk they already have 400 books about Bauhaus. 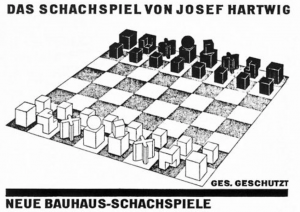 The only problem is that in most books you can only find one sentence about the chess set from Josef Hartwig. For example if you take Bauhaus from Frank Whitford. This book is written in 1984 and you could see that they knew really much about Bauhaus, but the book is not that big or thick like the books that are now written that subject. 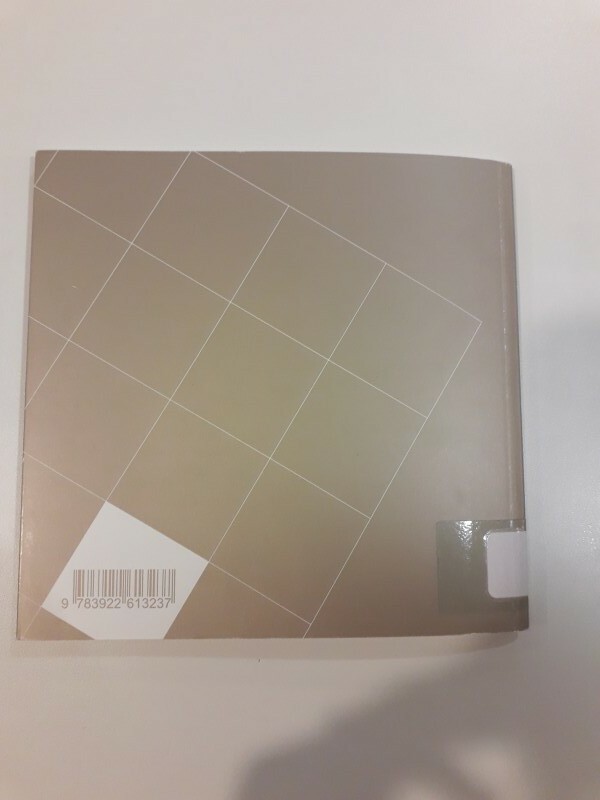 If you search in this book for Josef Hartwig you see that he is only mentioned on two pages (64 and 149). On page 64 his name is only in one sentence where he is mentioned because he took over the wood-carving workshop and the sculpture workshop. On page 149 there is a picture of the chess set and her is more information about it as well. 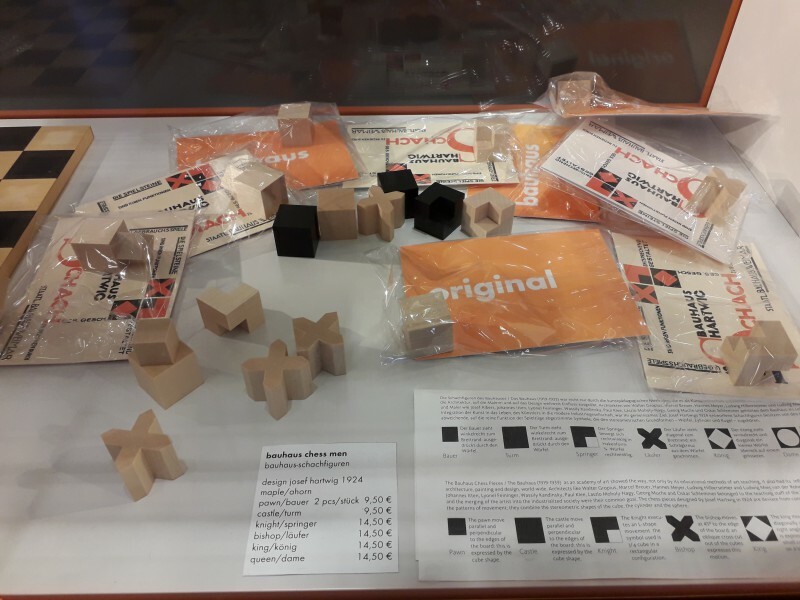 Its nice to see that the chess set on the picture has still a cylinder for the queen in the Stedelijk it became a square. These books you could see as pawns they carry a lot of information and they are important for the game, but individually they don’t say a lot about the artist or about some artworks. 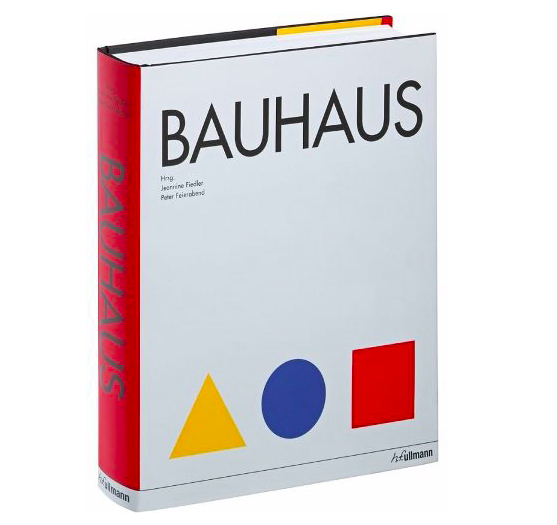 Than you have books like BAUHAUS from Jeanine Fiedler.This book came out in 2013 and is ta really big and thick book. It has 639 pages which is a lot of information. And even though there are so much pages there are only a few about Josef Hartwig. 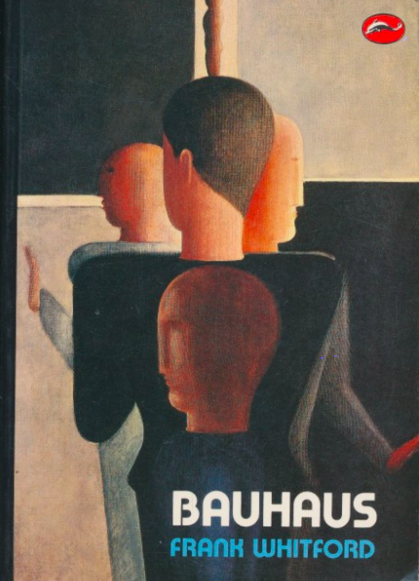 Books like Bauhaus design from Bernd Polster are more categorized versions. 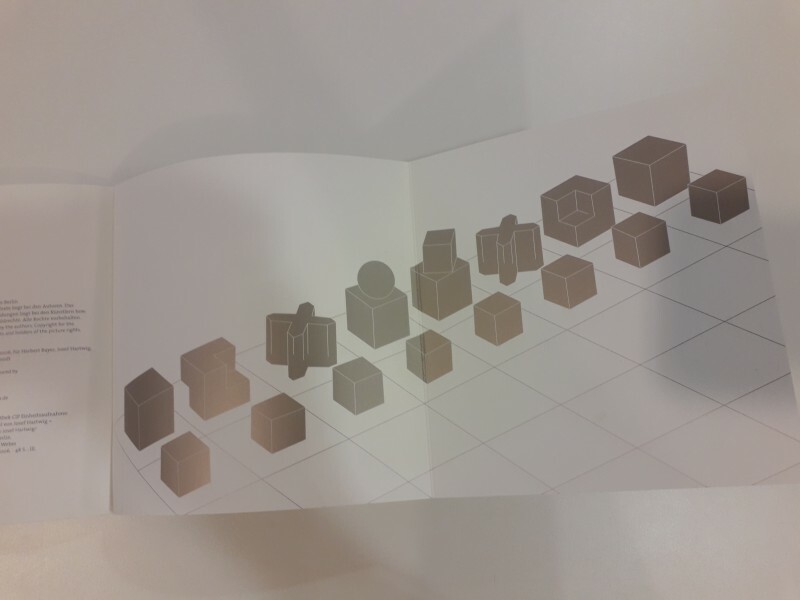 They have every design on one page and tell than some thing about the maker and the design piece. There are 350 pages and more than 200 design objects are being discussed. Both of these books are kind of new and so carry a lot of information. I think you could see this books as the castles, they are bigger than the pawns and stand on the edges of the game they protect kind of the other books, because they are also based n the other books. 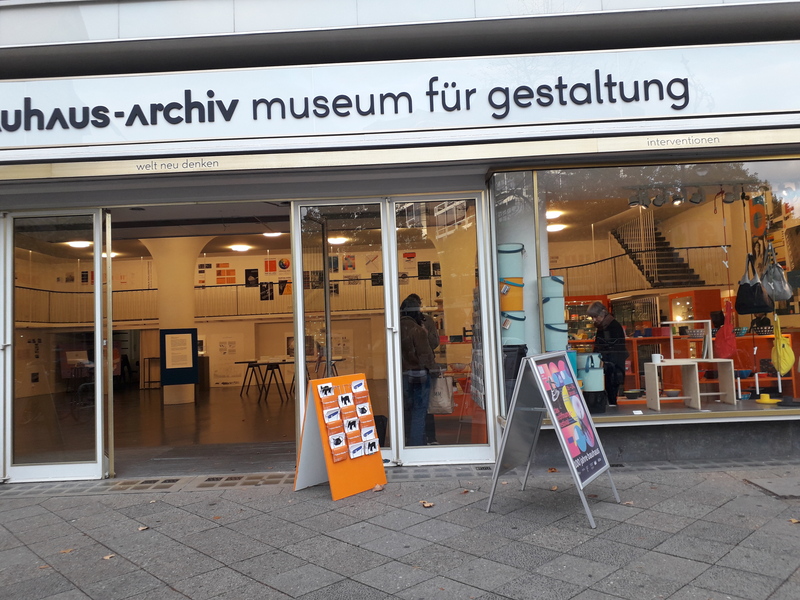 My next move was to go to the Bauhaus archive. 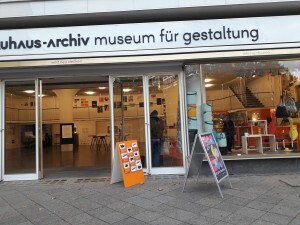 Only the real bBauhaus archive was closed and the one that was open now did only show things about the real Bauhaus archive building. I talked to one man that worked there if they had some information about the chess set. He said that they had one brochure, but unfortunately they didn’t had them anymore. 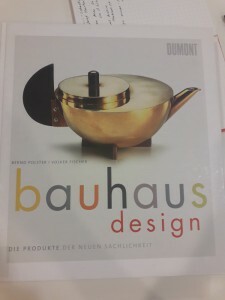 Luckily I did found some information in the Bauhaus shop. 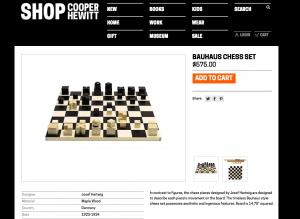 You could buy the chess set or even some spare pieces.. In the vitrine there was also a short explanation of the different shapes for each piece. All the pieces also had one postcard with them. 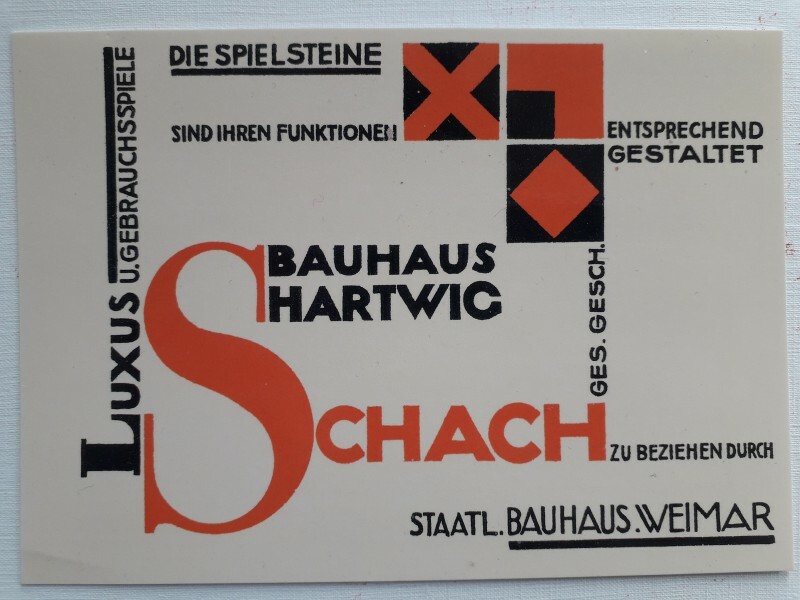 The postcard was a graphic design on the background it says: Joost Schmidt promotional card for the Bauhaus chess set by Josef Hartwig 1924. 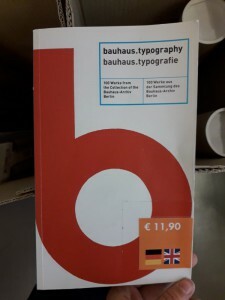 In the shop I also found the book Bauhaus.typography. 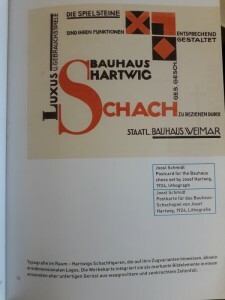 I think that Bauhaus.typography was for me the king of the search because this book let my see how in 1924 the work was being sold. 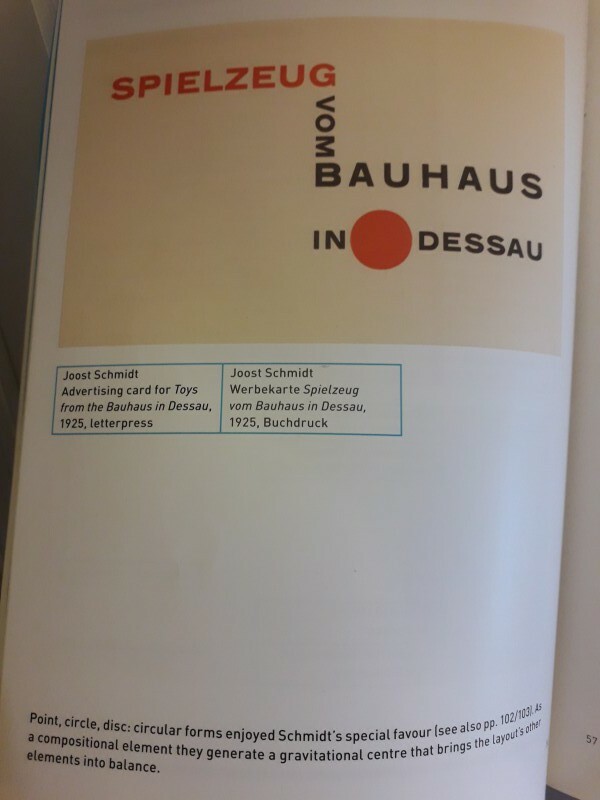 There was one chapter about advertising for the Bauhaus. 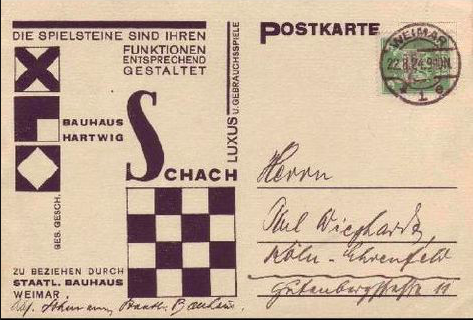 There was this one postcard again from Joost Schmidt that was made in 1924 with lithography. The postcard plays also with the shapes of the chess set. 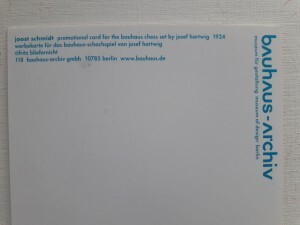 In this book it became clear that there was advertisement for the chess set in that time. 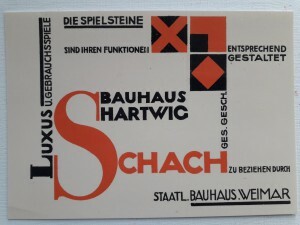 There was also this other advertisement card for all the toys/spielzeug from Bauhaus, that was also made tby Joost Schmidt. And of course there is also a queen the most important player in the game. The one with the greatest freedom of movement. 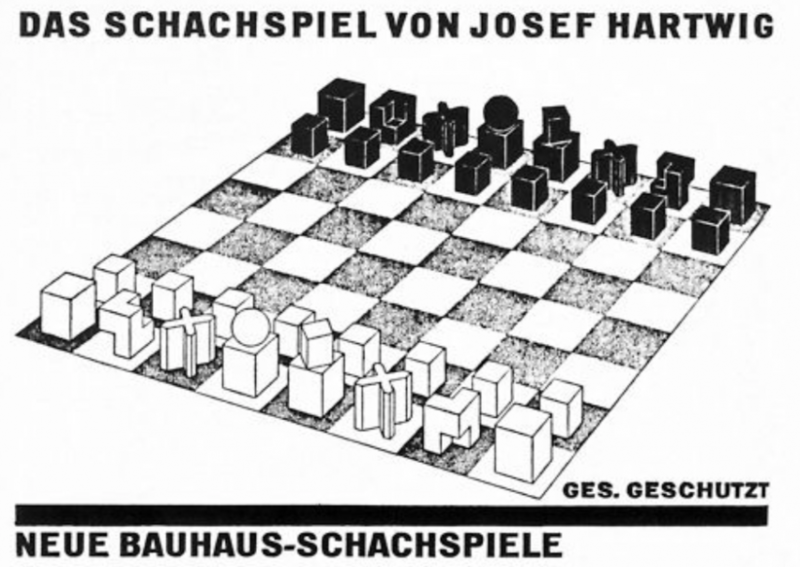 The queen of all the books about the chess set is Das Bauhaus- Schachpiel von Josef Hartwig. Produced in 2006 by Bauhaus-archive. 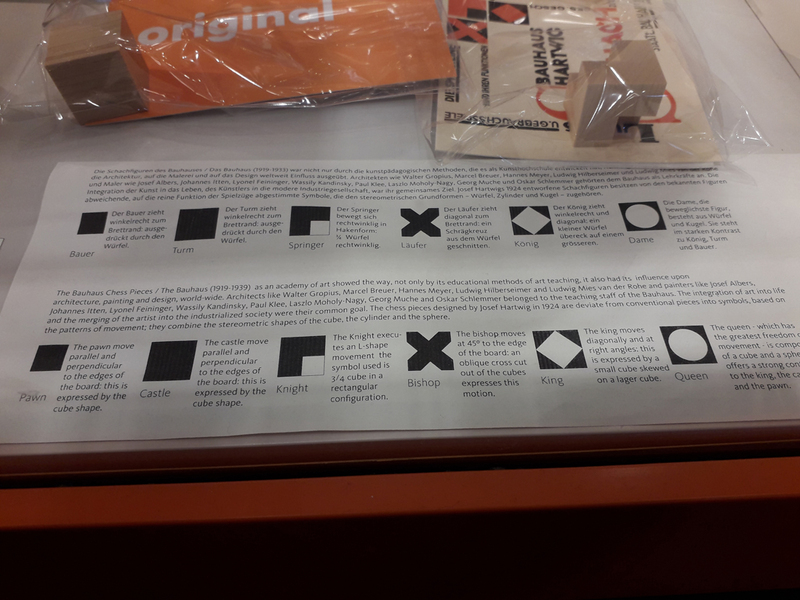 This books actually says everything about the chess set. This book is illustrated by some of Joost Schmidt his work.This book has 40 pages and explains the chess set both in Deutsch as in English. 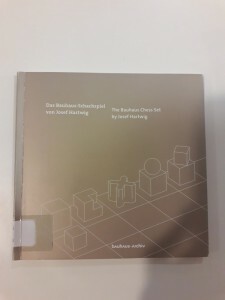 The book is written to Dora Hartwig, who is the daughter of Josef. On the other side of the chess set are the black players waiting for there turn. In other words all the information you can find on the internet. This information is more chaotic some pages only show the basic information like the size of the chess et. It also really depends on what you are looking up. You could say that the pawns in case of the internet is the language you look up the information. 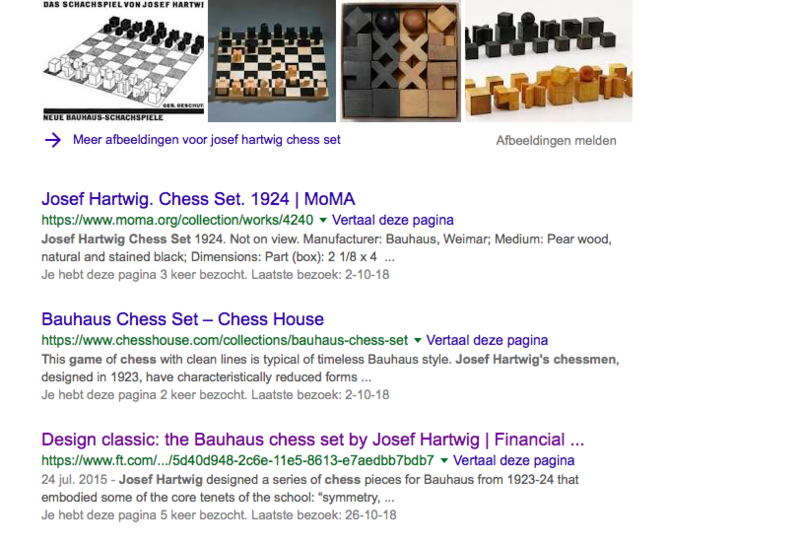 If you look it up in English the first website you get is the MOMA, this is the museum that has the original chess set. 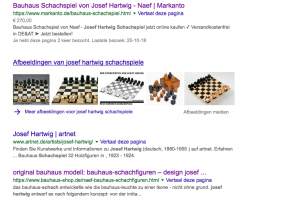 In Germany the first website you get is markanto.de this a site where you could buy a chess set for 270 euro. 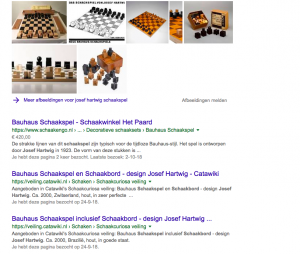 If you look it up in dutch you will chess shop in Amsterdam called “het paard”. 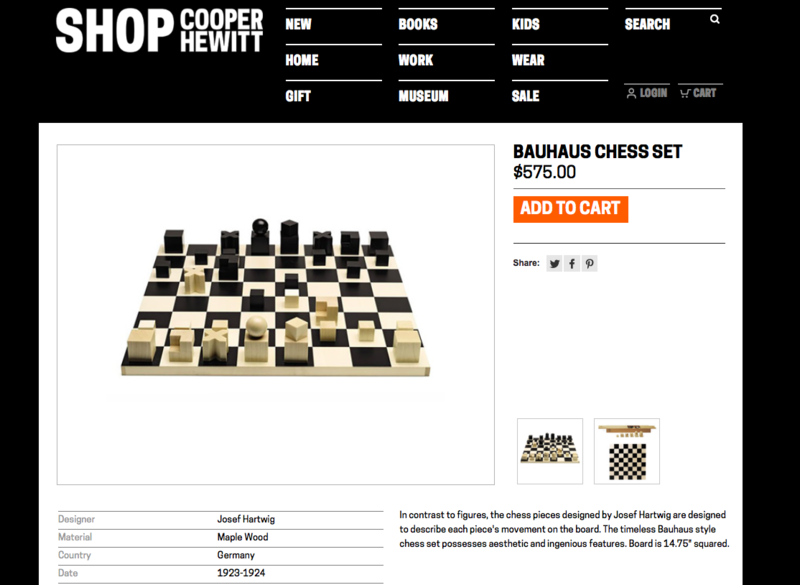 the chess set is more expansive there it is 480 euro. The looking up of the different language was my first set. And because of the moving pawns there was space to move the castles which were all the website with accuets and shops. Where the prices really change in case of how old they are. 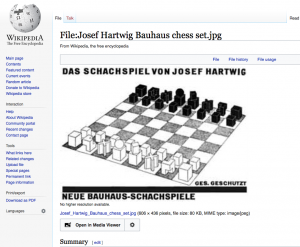 If you look up images the first picture you get is from a shop that sells the chess set the last picture you get is from a site that I hope was a test or something because the purpose is really unclear. 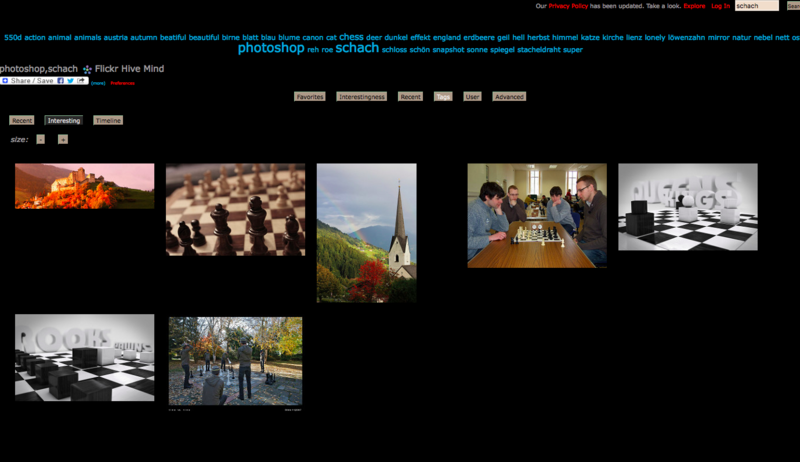 I think the images are for my also the pawns it’s a tool to find useful websites. I hoped the Stedelijk museum or the Bauhaus-archive would have information on there website and be my black queen.. Unfortunately this wasn’t the case. There was not one photo, text or sentence written about. Also site’s like Wikipedia didn’t give me much information the only thing I got was a really blurry picture of a drawing of the game. You could say that on this point that white was leading the game. This file might not be in the public domain outside the United States and should not be transferred to Wikimedia Commons unless it can be verified to be in the public domain in its country of first publication, as Commons requires that images be free in the source country and in the United States. If this file is in the public domain outside the United States, add |pdsource=yes to this template to hide this warning. This file is a candidate to be copied to Wikimedia Commons.Any user may perform this transfer; refer to Wikipedia:Moving files to Commons for details.If this file has problems with attribution, copyright, or is otherwise ineligible for Commons, then remove this tag and DO NOTtransfer it; repeat violators may be blocked from editing. This file was suggested for transfer by a bot (User:ContinuityBot). Please verify that this file is suitable for Commons before transferring it. If you looked it up on the German wikipedia there was actually some information. Youtube itself is also a pawn. If you search on youtube you will find videos some just about information, some as a marketing video and some just as an artwork. Video made for people who love to play chesst. It’s only a slide show with really bad quality images. 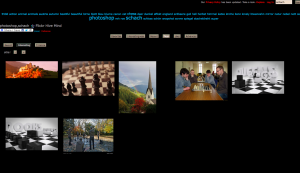 This blog is a place for projects that do not fit on the main site jesper-carlsen.com because it is considered as an archive for completed artworks. It is experiments that has been abandoned or not yet found their final form. I think these experiments still bear some relevance as glimpse of the underlying practice. On a personal level it feels good to have a place for these projects and perhaps even set them free in a way. Then other might see an idea and develop it further. Its something that I would like to see from other artists as well because I think it may show something interesting. This video is made for an exhibition. The video is from Fondation d’entreprise Hermes.This is an organitation who has world wide 5 exhibition spaces. I do think this video was a king the information is clear, but I do think that it’s a little bit boring especially with the gloves on her hand while she gets the game out. It’s still a game. Articles about the chess set where the bishops for me the gave a way much information, but they where always written from someones point of view. 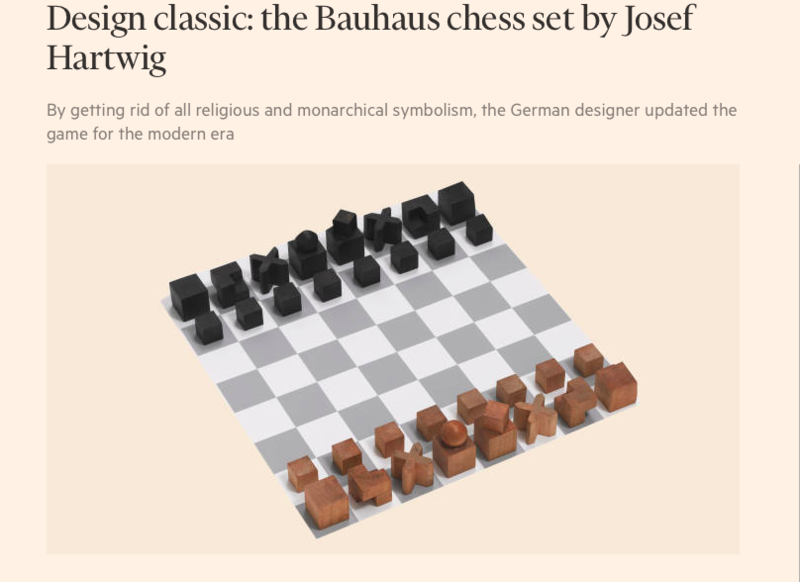 Like the financiel times wrote a piece about the chess set and it’s really much about the cost of the game. I think this fits with the bishop because he only moves at 45 degrees and so doesn’t take over the whole chess set. One of the most interesting articles was from eyemagazine/blog/post/modern-games this the article is not really long, but I think really clear. 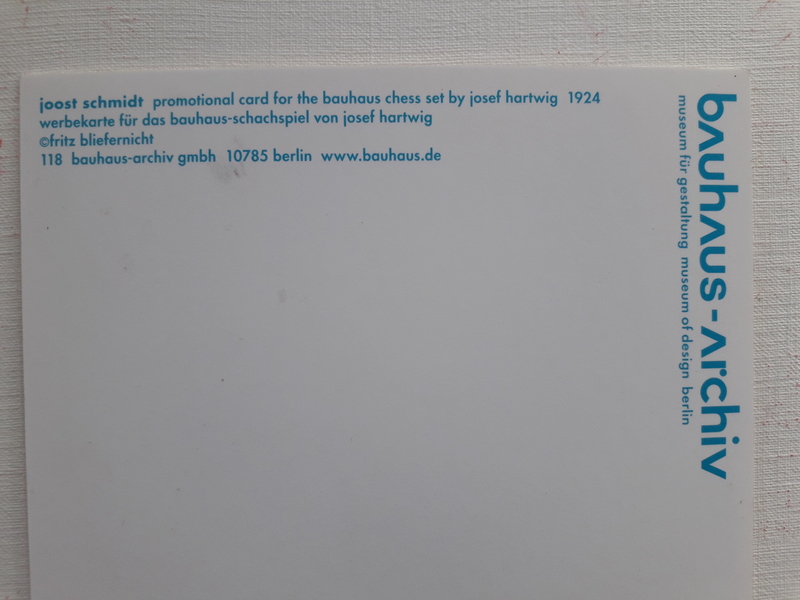 If I am being honest I don’t think the internet has one king or one queen, but what I do like from the internet is that when you have found some materials in books you could dig deeper with the internet, for example this back page of a Joost Schmidt postcard. Or this website that showed that Dora Schmidt gave big donation to the Bauhaus-archive in 2006, this also explains why they wrote Das Bauhaus- Shachpiel von Josef Hartwig to Dor Hartwig. 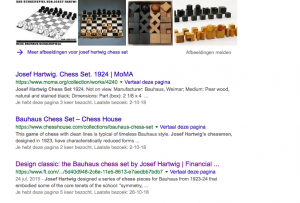 I was quite disappointed in the information I found on the internet, most of it were prices of the chess set and for the auctions. 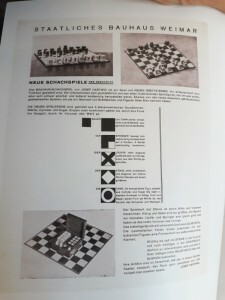 There was not a site specially made for the chess set, not like the one book from Bauhaus archive. I also have to say that I think the books are more reliable: they aren’t articles with one point of view, they aren’t website that try to sell the game to you and they aren’t blogs with one person behind it that isn’t a specialist. I also thought it would be easier because you just look up one word and you get tons of information, but what do you have on that information when it actually doesn’t say much? Turn the page because it is Chess mate.